"Whenever a sforzando occurred, he tore his arms—which he had previously crossed upon his breast—asunder, with great vehemence. At a piano, he bent himself down; the softer he wanted it, the lower he bent. If a crescendo then entered, he raised himself gradually again, and at the entry of the forte sprang up high. To increase the forte yet more, he sometimes joined in with a shout without realizing." This production from BBC television presents one of the great conductors of our time at the head of an all-Beethoven program that can certainly be called vigorous. Opening the program is the overture, op. 62, to Heinrich Collin's play Coriolan. This piece is not too well known, but is without a doubt one of the most dramatic musical compositions ever written. Beginning with ominous chords that break up in shotgun staccatos, it crashes into a furious perpetua mobile before resigning back into a mysterious set of chords. Solti gives this work all the sparkle that it deserves, and he could hardly have chosen a better piece to use as the opening salvo for this concert. Murray Perahia is the soloist for Beethoven's Piano Concerto No. 1, op. 15 (actually the third he composed, after a juvenile effort and Concerto No. 2, op. 19). The first movement has some wonderful moments here where the strings alone play off against the piano. Perahia's delicate touch during the triplet movements gives segments of this a highly ethereal feeling. The third movement is an exemplary piece of fire and brilliance, with its wild second theme reminiscent of a silent film accompanist gone wild. Perahia, in the first movement, uses the lengthiest of the three well-known cadenzas that Beethoven wrote for the piece about a decade later; although it certainly fits, the flavor of the cadenza is rather more dramatic and intense than the movement proper, and Perahia milks it for all that it's worth. The camera spends a great deal of time on the pianist's hands, and there is plenty of flashy fingerwork to be seen here for visual interest. 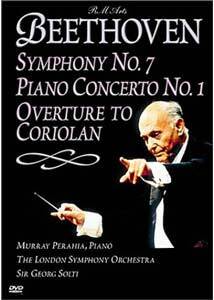 The centerpiece of the program is the Seventh Symphony, one of the very greatest works for orchestra. Solti and the London Symphony give it a lively reading, almost as if to shake some of the dust off of the old warhorse. Solti's tempo on the second movement Allegretto is rather more brisk than I'm used to, but it sounds divine, particularly in the fugal conclusion for the strings. The horn calls at the end of the first movement are bright and forward, making a clear statement and emphasizing the finality of the coda. Alas, Solti must have had a hot poker game to get to, because he neglects to observe most of the repeats. Only those that, if omitted, would utterly destroy the musical sense are retained. Thus, there is no repeat of the first allegro in the first movement (though in Solti's defense, this one is rarely observed). Less forgivable is the omission of nearly all of the repeats in the Scherzo, which results in the recapitulation being nearly the same size as the first statement, setting the structure into disarray. The sound balance seems a bit off at times, though it's difficult to tell whether this is an artifact of the performance or of the mixing. During the Concerto in particular, there is hardly any audible difference between piano and forte. The woodwinds seem much too forward, often drowning out the entire string section playing forte, which is inexcusable. This appears to correct itself for the Symphony, but does detract significantly from the pleasure of the fine performance of the Concerto. The running time is padded by about four minutes of curtain calls. Image Transfer Review: The full-frame image looks about as good as is to be expected from a live concert shot on videotape. Black levels are surprisingly good, and the color seems quite accurate. The main problem is a general softness of picture which can be attributed to the videotape medium. However, I have no complaints whatsoever about the transfer per se. Nor did I observe any video dropouts. Audio Transfer Review: The audio, unfortunately, is where this disc provides a serious letdown. Throughout the concert there is a persistent hiss that is quite loud and rather distracting. As noted above, the dynamic range seems compressed on the Concerto, but is much better during the symphony. The sound on the 5.1 track is enveloping, without much in the way of directionality to the instruments. The Dolby Surround track suffers from the same hiss, and in addition has much less clarity, definition and brightness. The 5.1 track is much to be preferred. Extras Review: Not an extra do I find. Chaptering is minimally satisfactory, with one stop per movement. I would suggest at a minimum for a concerto that there should be a stop at the beginning of each cadenza. The other works have natural breaks during movements that would make appropriate stops as well. Something to keep in mind when designing such discs. Mysteriously, there is a violin soloist prominently featured on the case and the main menu, despite no such soloist appearing at any time during the program. A superb performance of some of the greatest works in the repertoire, unfortunately brought low by persistent hiss and some odd sound mixing decisions.